Christine Blasey Ford ceased to exist the moment that Brett Kavanaugh began his testimony before the Senate Judiciary Committee on Thursday afternoon. Despite hours spent answering questions with a kind of graciousness that was devastatingly familiar, despite the polite formalities of the process—“I thank you very much for your testimony; more importantly, for your bravery for coming out,” committee chairman Chuck Grassley told her—Ford disappeared as Kavanaugh came into view. It was then that the hearing could settle into its true purpose: a stage for a man to clear his good name. The phrase was repeated several times throughout the day by Republican members of the committee and Kavanaugh himself. Republicans on the committee would not let him be driven out, not when a man’s good name was at stake. “And you’re right to be angry about the delays in your ability to come here and protect your good name,” Texas Republican John Cornyn told him, more a comment than a question, which is how most of the Republican men on the committee spoke to Kavanaugh. It was a scene of commiseration, a shared sense of incredulity that this could happen in the first place. Kavanaugh was right to “come in and clear his good name,” said Thom Tillis of North Carolina. Ted Cruz lamented that Kavanaugh’s “good name” had been “dragged through the mud.” It had been “one of the most shameful chapters in the history of the United States Senate,” he said. You can describe what happened in a few different ways—how the ideological demands of the Republican Party are themselves obscene and require extreme obscenity to accomplish, how Kavanaugh and Lindsey Graham’s respective performances were a strategic demonstration of fight for a presidency that seems fixated on these things, that Kavanaugh almost certainly lied under oath about a life spent drinking but never once losing a shred of memory—but there was something more fundamental about what happened. The hearing was a reassertion of white male grievance, of the power of prestige, of the things that money and a good school and a good name will buy you. It was a demonstration of the way things work at a moment when it seems like the scales might be tipping, even slightly. There was something all-consuming about the feeling of watching this happen in realtime, the sense of powerlessness in the face of a violently self-preserving system. 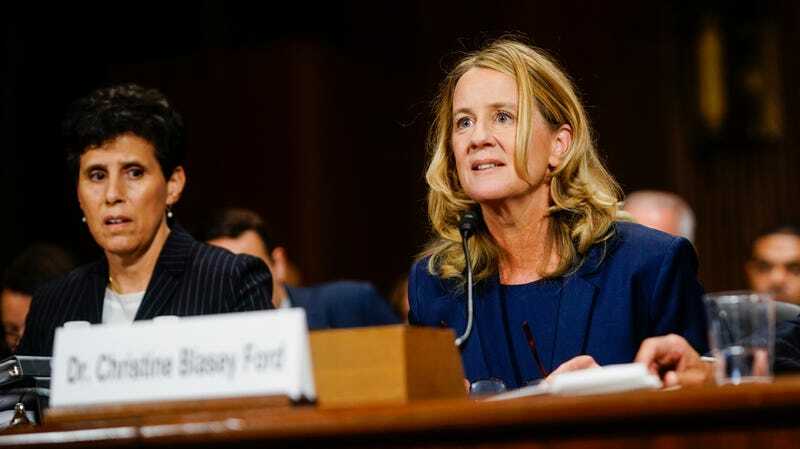 The sensation of Ford receding from view—her hours of testimony, another woman publicly reopening wounds out of a sense of responsibility and a fragile belief that it might actually mean something—obliterated by the rage of powerful men. Ford, nearly two weeks earlier, had predicted that future and called it by its name: annihilation. Maybe there is some comfort in seeing it coming.